HTC one X is one of the sensational high end phone, and if you compare this with Galaxy SIII, another android smartphone crasher, HTC just goes Head to head. Even though Samsung is on way of huge success and it has got 10 million sold out unit within Galaxy SIII’s first two month on the market, HTC is not far behind of them. Thanks obviously goes to different career, To get this cutting edge high end phone AT & T is going to offer a discount of $100 with its starting of selling HTC One X. They will through the offer soon with a$99 for device and two year of contract. The Good News is some of the retailers are also through amazing bonuses; RadioShack is such retailers who are also offering retailer’s trade in for HTC One X selling. On the offer of RadioShack you also have to take the contract of AT&T for two years. 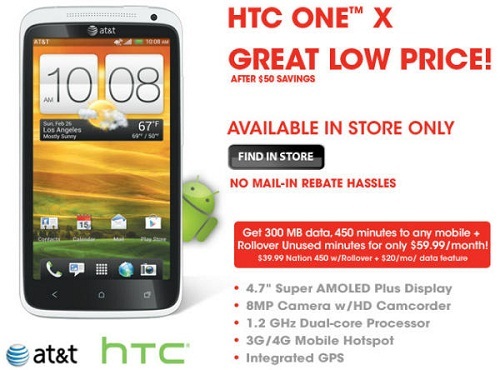 RadioShack is offering the HTC One X with Trade & Save Promotion of $30 to $300 to give consumers some extra savings on the phone. But the only catch is you have to leave your old phone to them. It’s a good offer to save money and getting a very high end smart phone like HTC One X. Also starting on Sunday is RadioShack’s $30-$300 Trade & Save Promotion for extra savings on the HTC One X when a customer trades in their old device.This means any customer who trades in a phone in working condition and purchases a new postpaid handset with a new or upgraded two-year agreement will receive a minimum of $30, and up to $300 for their traded-in device. RadioShack’s $30-$300 Trade & Save Promotion will run until Saturday, August 11. Cool News but this At & T Htc one x is updated which version ?